The alignment of your teeth plays a vital role in your dental health and confidence. Although you have probably considered braces, the thought of slightly metal wires and brackets does not fit your lifestyle or comfort level. Now, you can choose a sophisticated option that allows you to get a straight smile with confidence. At Tomko Dental Associates, our cosmetic dentist offers Invisalign in Allentown. The FDA-approved treatment has quickly become the preferred choice because it is virtually invisible and provides exceptional benefits. Traditional braces use metal brackets and wires to pull the teeth into their correct position. Although they are effective and several advancements have been made to make them less noticeable, they are still highly visible. Now, you do not have to let metal wires and brackets further impact your self-esteem. Invisalign uses a series of custom-made, clear aligners that are worn over the teeth. The aligners are created in a series using impressions of your mouth. With a custom-fit, you enjoy a less noticeable and comfortable treatment. There are no protracting wires or brackets as the aligners are smooth. Overall, you will have a more comfortable and convenient treatment. Oral hygiene is easier and there are no dietary restrictions because wires and brackets are not used. Plus, you will not have irritation to the inside of the tips or discomfort from the pulling of wires. After creating your treatment plan, you will wear each aligner in the series for about two week for 22 hours per day. You will only remove the aligners when eating, drinking, and caring for your teeth. During your treatment, you will enjoy added convenience because you do not need to have adjustments made to wires. As a result, you will not need to come into our office as often. However, we do require check-ins every few weeks to monitor the progression of your treatment. On average, you can expect your treatment to take about 12 months. At the end of your treatment, you will need a retainer for a short period of time to prevent your teeth from moving back into their previous positions. When compared to traditional metal braces, Invisalign produces the same high-quality, effective results when used on the ideal candidate. As a dentist in Allentown, Dr. Tomko will provide a consultation to ensure the treatment will work for your alignment and bite issues. In most cases, as long as the rotation or tilting of the teeth is not extensive, you can benefit from the clear aligners. In addition, gaps between the teeth cannot be too large. To ensure the treatment is right for you, Dr. Tomko will use a visual examination and digital imaging to create your treatment plan. If you are ready to get a confident, healthy smile without a mouth full of metal wires and brackets, it is time to see if Invisalign is right for you. 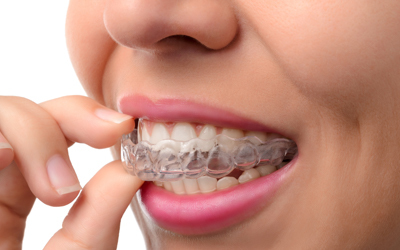 Contact Tomko Dental Associates today to see if you are a candidate for clear aligners.